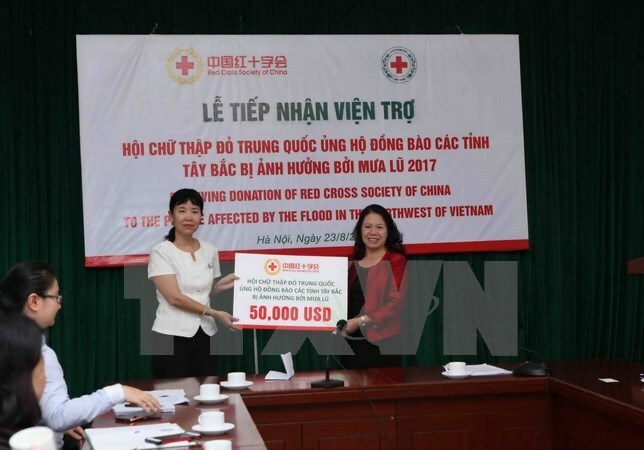 Hanoi (VNA) – The Vietnam Red Cross (VRC) on August 23 received 50,000 USD donated by the Red Cross Society of China (IFRC) to support people in the northern mountainous region affected by recent torrential rains and floods. This is the second time the IFRC has donated to help Vietnamese localities surmount disaster consequences. Chargé d’affaires of the Chinese Embassy in Vietnam Yin Haihong said that through humanitarian relief activities, the relations between the two Parties and peoples have been tightened and lifted to a new height. VRC President Nguyen Thi Xuan Thu appreciated the timely and meaningful assistance of the Chinese organisation, adding that its gift will be sent to northwestern inhabitants and effectively used for relief activities. According to her, the two organisations have established their partnership for years. The relations have been expanded through activities to prevent diseases in border provinces, delegation exchanges and the sharing of experience in response to natural disasters and in health care. In 2016, the IFRC provided 200,000 USD to support flood-affected locals in the central region and 50,000 USD for central, Central Highlands and southern localities hit by drought and salt intrusion. It also assisted 700,000 RMB (about 2 billion VND) to help the VRC build a project to improve resilience for different communities. According to a VRC report, as of August 22, floods in the northwestern region claimed the lives of 29 people, left 16 missing and 28 injured.